Seven years ago, Alexander Payne dispensed a masterful romantic comedy called “Sideways” on us. Then, he all but disappeared, meaning that for seven long years theaters lacked the likes of Jack and Miles and Tracy Flick. Finally, Payne’s fifth feature as a director, “The Descendants” has hit theaters, and it’s the kind of film Payne must have been working toward his whole career to make. King is a lawyer, a land baron, and an absent father. Like most of the people around him, he wears a tropical shirt every day. However, rather than conveying relaxation, wearing these shirts just seem to convey stress. King comes home one day to find his wife, whom was always fond of extreme sports, to be in a coma after a boating accident. Not only must he care for someone who is on their deathbed, but also his daughters whom he barely knows. His youngest daughter Scottie (Amara Miller) turns out to be a precocious mess without the guidance of her father. 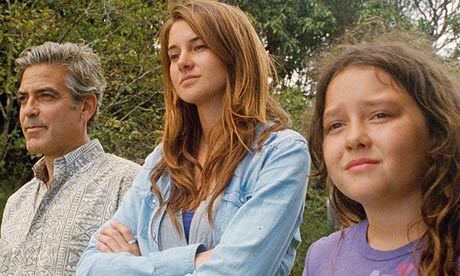 The oldest King daughter, Alexandra (Shailene Woodley), is a so-called problem child who surprisingly steps up to the plate once her mother isn’t around. Matt’s attempts to rekindle his relationship with his daughters is rough at first, but every minute of the film is a representation of him making a step in the right direction and becoming a better father. Along the way, Matt finds out the nasty little secret that his wife was having an affair with a real estate mogul (Matthew Lillard), something that Matt’s ineptitude as a husband might have forced her into doing. This all leads Matt to explore one big question: can you forgive somebody who is in a vegetative state? Just as the eldest daughter must step up to the plate, so does Clooney in this challenging performance, and he definitely delivers, in one of the best roles of his career. Payne has a habit of getting his actors to go against character, and Matt King is the equivalent of Jim McAllister years after he decided to flee Omaha and Warren Schmidt before reaching old age. Clooney is best at playing characters who go through a crisis but this time, he gets a happier, or more accurately, uplifting, ending. Clooney is an actor who usually gives very commanding performances. His performance in “The Descendants” is a different kind of commanding, the more quiet kind, the kind that could win him an Oscar. His character doesn’t speak in monologues in front of a crowd but rather in long monologues inside of his head. Perhaps he is trying to reach out to someone that won’t listen, or rather justify his own actions in the comfort of his thoughts. Either way, it sends the message that his neglect never came from lack of love. Perhaps a lack of understanding might be a better way to describe it. 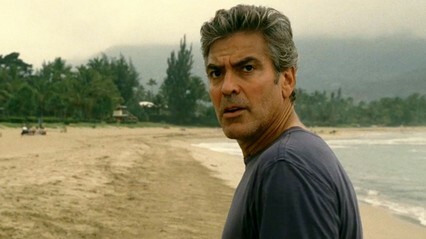 “The Descendants” moves at a leisurely pace, making the good times better, and the tragic times more painful. Here is a film that wants its audience to wallow in both joy and sorrow. The audience is given ample time to get to know the characters, and soak in the fantastically convincing screenplay by Payne, Nat Faxon, and Jim Rash (yes, this guy). “The Descendants” uses its Hawaiian locales to their full potential. While this film dispels the myth that Hawaii is a paradise, it doesn’t shy away from the images of sandy beaches and towering green mountains from the Hawaiian stock photo factory. And why not? While Hawaii is a place filled with hardships like any other state in America, it is still a damn beautiful place to live. At the core of “The Descendants” is a tragedy that causes many other tragedies. What this film does so interestingly is disconnect its audience from the tragedy. We never do witness the tragic accident that put Mrs. King into a coma, nor do we get to witness her being alive at all (there aren’t even any flashbacks of her provided). It is this disconnect that ultimately makes “The Descendants” such an uplifting film, because in the aftermath of a tragedy, there is a certain unpredictable nature, as if there is nowhere to go but up. And that is exactly what the King family needs. And as an audience member, it’ll make you love this film even more than you thought you could. 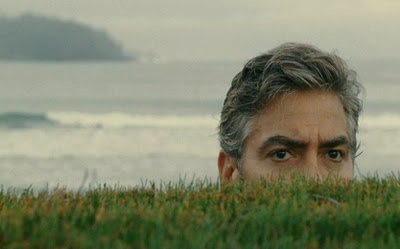 This entry was posted in Alexander Payne, George Clooney, Hawaii, Movie Review, The Descendants on November 21, 2011 by ian0592. Why do people go out of their way to describe places like Hawaii and Southern California as “paradise”? There is no such place on this earth. And when people discover that these places are not “paradise”, they make such a big deal about it?